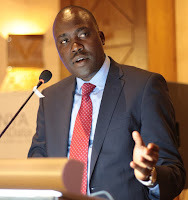 Friday February 8, 2019 - Deputy President William Ruto’s legal advisor, Korir Sing’oei, has hit out at the Director of Public Prosecutions, Noordin Haji, and the Directorate of Criminal Investigations, George Kinoti, over their complaints that the Judiciary has not played its part in the war against corruption. In a statement to Kenyans, Sing’oei said failure by Haji and Kinoti to secure convictions was as a result of their poor cases not the Judiciary as they would want Kenyans to believe. He said the Judiciary could only convict based on evidence and challenged the two to up their game and play within the rule of law. “Only when a prosecutor, whose incentives are to secure conviction in each and every case confronts the court with evidence of an accused’s culpability, satisfying legal thresholds ought a conviction to follow." "Equally, when shoddy investigations are used to found a charge and sustain proceedings, courts, whether ICC, Kenyan or Nigerian, must come out in the name of justice and fairness to pronounce the accused not guilty,” Sing’oei stated. At the same time, Singe’oei alleged that the campaign to discredit the Judiciary was being done by high-profile unnamed people that he accused of seeking to use the Judiciary to settle political scores.